As is known by all people with critical thinking skills, Obama’s words all have expiration dates. He has broken his word and contradicted himself on all manner of issues. And the latest? Drill, baby, drill. When he was Senator Obama, Candidate Obama, he mocked Palin’s “drill, baby, drill” as totally useless. He said he won’t do it, period, end of story. Turn the page, and he’s saying “drill, baby, drill” (if these other people agree). I cannot believe anything other than he’s trying to hook enough Republicans (only one or two in the Senate) to get his crap and tax passed (which will further destroy the US and all liberty). Yes, he did recently suggest a “drill, baby, drill” approach after he gave his word that was off the table. That means he lied. His announcement surely angers those extremist environmentalist nut-jobs who helped get him elected. But what are they going to do? Vote Republican? It is to laugh. He knows his own people will put the kybosh on it for him. But it’s great PR for those independents and jello-brained Republicans. He tried but he was denied. The fringe freaks will be mad at him but they have no other place to put their votes. The sycophants will ignore his about-face as if it never happend, all the while continuing to vote the way he wants them. The politically unattuned will see this as a good step forward (and ignore the step never really happened). And he could peel off a vote or two in the Senate (and that’s all he needs) to pass crap and tax and other destructive extreme leftist measures. There is no honor in Obama’s announcement. There is no honor in Obama’s “expiration date Word”. But he’s betting on enough people in the Senate and in the voting public to be brain-dead. Unfortunately, the odds of his bet are strong. There are too many squishy useless idiots in the Republican part of the Senate for him to make hay while destroying the US. There are also still too many “I’m not into politics at all” voters in the US. And that’s what Obama is counting on. Truth has no place in his agenda, else he couldn’t accomplish it. Here is proof the free market is more uplifting to the masses than government control. 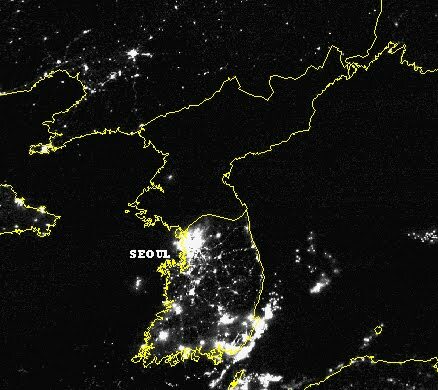 As you can see in the night-time satellite image of Korea, South Korea is lit up and North Korea is dark. This is very strong evidence of which version of government provides greater opportunity for the masses. The image shows South Korea (the one all lit up), North Korea (the one almost totally dark), China (which has sparse, barely lit spots), Russia (which also has sparse, barely lit spots) and a few other places that my geographic (lack of) understanding doesn’t permit me to name, without further research I’m too lazy to do. But as you can see, the democratic and free-market South Korea is orders of magnitude more affluent than Communist China (which has only recently begun a version of free-market), and formerly and soon to be Communist Russia. And those two nations with a heavy Communist impact are also nominally better than Communist North Korea (with the god-like worship of its generational leaders). Those of you who want more government control and more “nanny state” for the good of the little people really need to examine which form of government offers the greater opportunity. This satellite image provides substantial proof your accusations of “selfish capitalists” are very inaccurate, by several orders of magnitude. HT Watts Up With That for the satellite image. It only makes sense certain particular hits to my site are government hits. I provide information that could be dangerous to the government if the little people saw the information. I am a danger to the government’s version of utopia, so it only makes sense for the government to notice me. Am I being paranoid? I think not. My flag counter is evidence for what I say. Who else would hit my site, if not a government official, in the Communist nation of Vietnam? Okay, that wasn’t quite what you were expecting, obviously. But a hit from Vietnam wasn’t something I was expecting, either. I don’t know how many people in Vietnam have computers, nor do I know how many would have internet access. But I’m sure the number would only be “several dozen.” And using China’s restricted and censored internet access as an example, I can’t imagine there would be many people in Vietnam with internet access who could access a site like mine. I know, it’s a curiosity with no real value. But it is still an intriguing curiosity, nonetheless. The Lion, The Witch And The Wardrobe is the first in a series of seven novels by C S Lewis. Actually, the first novel in the series, fantasy historically speaking, came fifth in the series, I believe (but don’t read ahead, or you’ll lose a lot of value in the series). I very much enjoyed reading that series as a teen. I also very much enjoyed reading that series to my daughter prior to her reaching the ripe old age of ten (and she enjoyed my reading it to her). It was full of Christian messages, such as obvious failure, not-so-obvious failure, redemption, and duty. Of course, the seemingly omnipotent evil vs the seemingly impotent good played a major role, as well (as it does in today’s real world). After I watch a movie on DVD often enough, I watch the movie with attached commentary. There are two commentaries on LWW, one with the kids and one with people behind the scenes. Both include the director. Andrew Adamson directed both LWW and the following Prince Caspian, but didn’t direct the upcoming Voyage of the Dawn Treader (due out 12102010) and I believe I know part of the reason why. Walden’s LWW relied heavily on C S Lewis’ book with some artistic differences, which is common in movies. And I don’t have a problem with that, at all. It’s expected. Those who hadn’t read the book prior to watching the movie wouldn’t notice anything missing and would very much enjoy the movie. Many who had read the book still wouldn’t miss anything in the movie. But there’s a part in the book that is very much missing in the movie, and I was very much disappointed to find it missing. More on that soon. Abramson said he read the series as a child and was drawn to the series, but he has apparently missed the whole message interwoven into the series. Let me lay it out very clearly: Aslan is Jesus. There is no denying that fact. Aslan is Jesus. Without that clear understanding and the ramifications of that clear understanding, there can be no proper treatment of LWW with respect to C S Lewis. Listening to the commentary with ‘behind the camera’ folk, I found out Abramson had no idea why Lewis chose a lion (or he denied the reason to himself and searched for a different reason). Without that understanding, very much is missing. In the book, after the battle was over, Aslan chastized Lucy for ignoring everyone else and paying attention only to her then-healthy brother. “Must more die for your brother?” Abramson intentionally chose to remove this to prevent a let-down in the victory high. But it is very important in Christianity. Don’t let any victory high cause you to ignore your specifically laid out duties (she was responsible for the fire-berry juice and its use). And Christians fail and must be reprimanded, even in times of victory. This should not have been cut out and altered. Listening to the commentary on Prince Caspian, I heard more of Abramson’s lack of understanding. Dawn Treader has a different director, and from what I understand, is very interested in returning to the focus of the series to Lewis’ vision. But apparently, FOX, which took over from Disney, foolishly decided to release it in 3-D. It is due out, like I said, on 10Dec10. FOX will also release it in 2-D. I will not watch it in 3-D but I hope to see the 2-D version return to the meat of the meaning of the series of books. Fort Hood Is Known For … Hugs? I’m stealing DRJ’s post and posting it here. “Like the State of Texas, Fort Hood is big and boasts of being the largest active duty armored post in the United States Armed Services. Fort Hood is nicknamed The Great Place because of the quality of life the post and area offer Soldiers and their families. These qualities are important, especially with home-basing initiatives, frequent deployments and family stability and support. “Elizabeth Laird is the official Fort Hood Hug Lady. The Fort Hood airport is her home away from home. It doesn’t matter whether a plane filled with soldiers is taking off or coming home. It doesn’t matter whether the plane leaves at 3:30 a.m. or arrives at 3:30 p.m.
Fort Hood estimates Laird has hugged at least 500,000 soldiers in almost seven years and apparently she hasn’t missed a flight. That’s nearly 7 years of commitment by Mrs. Laird, packed into a lifetime that hasn’t been that easy. Well done, Mrs. Laird, as well as the Soldiers you hug. This post made me cry. Mrs Laird is definitely a Gift sent from Providence. Fort Hood has been my daughter’s duty station since she left AIT, and that airport is the same airport she went thru to get to and from Iraq. I’m gonna have to thrash my daughter for not mentioning the Hug Lady to me. Posted in Character, charitible organizations, military, Personal Responsibility, society | Comments Off on Fort Hood Is Known For … Hugs? The Searchlight, NV TEA Party yesterday had at least dozens of people show up and hear Sarahcuda. I expect that anyone who has been to a TEA Party and had taken lamestream media’s reporting with a grain of salt are now taking lamestream media’s reporting with “at least dozens” of grains of salt. The more the likes of CNN and MSNBC lie about the facts, the more they seal their own fates. Well, I heard the news talking about how Israel announcing they’d be building new places when Biden showed up was a huge insult, I started musing on why. Solution: Obama and co actually believe the whole “Israel is a puppet of the US” stuff, so of course the way Israel is acting like a country with its own interests is pretty insulting. I’m starting to wonder if I wasn’t more accurate than I thought…..
Sure sounds like someone who thinks he’s in charge. I previously created a list of Self-Proclaimed Right Wing Extremist™ Blogs and issued a request for membership. Any who wish to be a member of that list, feel free to request membership. But I have today added another blog list. I have created the Race Traitors blog list. If you are not white and you are a Conservative, you are a race traitor. Democrats and Liberals have proclaimed as much on multiple occasions. Some NY Guy admitted as much, in no uncertain terms. So, in my Self-Proclaimed Right Wing Extremist™ Blogs framework, I have decided to create the Race Traitors blog list. If you are an Uncle Tom, a House Boy, an Oreo, you qualify. In fact, you qualify if you are a Conservative and you are not white. I would like to qualify myself, but I am between 80 and 90 percent white, so I don’t qualify. I currently have five blog sites devoted to Race Traitors: Arlenearmy’s Blog, Black & Right, La Shawn Barber’s Corner, Michelle Malkin and Wake Up Black America. If you would like to be added to the list of Race Traitors, please provide your application along with proof that you are indeed a Race Traitor. And if you would like to be added to the list of Self-Proclaimed Right Wing Extremist™ Blogs, please provide your application. It’s about time we created the League of Men Voters. It’s about time we created The Congressional White Caucus Foundation. It’s about time we created Siroptimist International. It’s about time we created an international corporation devoted to gyms named Pecs. It’s about time we created the United White College Fund. This has gotten well past old. The Oklahoma Legislative Black Caucus is screaming “racism” because it can, I guess. “Members of the Oklahoma Legislative Black Caucus were both shocked and disappointed at Sen. Brogdon’s comments on the Senate floor that asked whether President Barack Obama would consider forcing Oklahomans to eat fried chicken,” said a statement issued Wednesday by Rep. Jabar Shumate of Tulsa, the caucus’ chairman, on behalf of its members Sen. Judy Eason McIntyre of Tulsa and Reps. Mike Shelton and Anastasia Pittman, both of Oklahoma City. All four are Democrats. During an Oklahoma Senate debate over the now-passed ObamaCare, Senator Brogdon asked what was next. “Are we all going to be forced to buy fried chicken?” is obviously a racist question because only black people eat fried chicken. Give me a break already. Haven’t these people ever heard the story about the boy who cried “wolf”? Brogdon is right, their complaint is indeed sophomoric. And Senate Pro Tem Coffee is wrong in calling fried chicken a “poor choice of words.” These black caucus types need to quit looking for racism under every rock and need to quit crying wolf. I spent time as an over-the-road trucker, a shuttle driver and a line-haul driver. Most of the time was spent non-union and just over a year was spent as a Teamster. And here are a few thoughts on that experience. Yes, Chicago is indeed called “The Windy”. Yes, NYC is indeed called “Dirty Side”. Having spent the vast majority of my time east of I-35, I don’t know if SanFran is called “The Shaky” or not, but I do know there is a line in the sand where truckers switch away from channel 19. Law enforcement does listen to channel 19 (on the west coast, I think it’s channel 17 but I’m not certain). In urban areas, law enforcement does indeed listen to channel 9 (the emergency channel) and will answer when a trucker calls them on it. I used it on several occasions in big cities. Four-wheelers are the scourge of the highways. They have this strange belief they own the highways, and will do all sorts of stupid things behind, beside, in front of 80,000 pound semis. Truckers don’t move left to let four-wheelers merge because many four-wheelers won’t clear the area to let the truckers move back right, or if they do, other idiot four-wheelers will keep passing on the right, leaving the truckers stranded in the left lane. Four-wheelers will shoot around truckers, pull back in front of the trucks, slam on their brakes, to hit the exit ramp they would have hit an entire second later had they waited. Ever get eaten up by a 40-ton vehicle that can’t slow down like you can? Four-wheelers don’t realize the over-the-road truckers with which they come in contact are in a “foreign” state. As such, four-wheelers don’t allow lane-changes necessary for truckers to get to the unexpected left-turn exit to the highway they need. Four-wheelers try to pass on the right when a truck is swinging wide to negotiate an in-town right turn, despite the truckers’ blinking right turn signal. Four-wheelers think they know everything about driving because they drive 15,000 to 20,000 miles a year while truckers drive 12,000 to 16,000 miles a month. Four-wheelers ram the back of trucks because the four-wheelers can’t judge the speed of the trucks ahead of them. Four-wheelers don’t understand a fully-loaded truck requires three times the stopping distance as do they. Four-wheelers don’t understand a bob-tail truck (tractor without trailer) requires six times the stopping distance as do they. Driving bob-tail is the most dangerous driving possible. I drove across the George Washington Bridge in Dirty Side with an empty trailer. I saw the idiot four-wheeler sitting directly beside my trailer tires (the trailer was empty). If you don’t know anything about the GWB, it is one very rough section of highway. The lanes were narrowed because NYC was working on a lane of the bridge. As I was traversing the bridge, the serious bumps caused my trailer to jump left. I don’t know if the idiot driver met my trailer or not, but he definitely figured out to back off and allow me clear passage. The US House of Representatives passed ObamaCare by a narrow margin, with every Republican and 34 Democrats voting against it. They passed ObamaCare with the majority of voters standing up against it. Reid, Pelosi, Obama, all sorts of other elected officials are gloating in their victory over the will of the People. To those on the left, I say THIS AIN’T OVER by any stretch of the imagination. To those on the right, Winston Churchill says “Never surrender. Never, never, never surrender.” This isn’t the end. This isn’t even the beginning of the end. This is merely the end of the beginning. Many on the right were calling ObamaCare Obama’s Waterloo. Now, many on the left are calling the House vote our Waterloo. Both are wrong. We on the right have faced our Dunquerque and our Pearl Harbor. This ObamaCare process to this point has been our Corregidor, Singapore, North Africa. We are now in our Tobruk and Guadalcanal stage. And Patton is making his preparations for the North Africa campaign. The reconciliation package faces many hurdles in the Senate. Hundreds of lawsuits are in the works. I have seen information suggesting multiple aspects of ObamaCare will not survive in court, based in part on the 3rd, 4th, 5th, 9th and 10th Amendments. States are bucking ObamaCare. Like Rommel’s over-extended North Africa supply line, Israel’s over-exuberant Sainai campaign (for their protection from Egypt), our “Bridge Too Far,” the left has over-extended itself and is very vulnerable in multiple ways. It’s time to turn the Primary season into Sicily, Italy, Coral Sea, and the November off-year election into Midway, Normandy. And thinking down the road, turn the 2012 Primaries into the Battle of the Bulge and Iwo Jima. Then the 2012 general election will become the Crossing of the Rhine and Nagasaki. And, yes, we will still have the long-term cleanup that will follow. The days are indeed dark right now, but Bismarck is gone and Truk is being severely harmed. This is definitely not a time for the weak-hearted and defeatists. This is a time for stoicism and resolve. The left has made a critical error: they have awakened the Slumbering Giant. And the Slumbering Giant is not at all pleased. I have been wandering around the blogosphere and I have seen some demoralized folk. I already went through that stage myself, after this monstrosity of a government take-over of our liberties was passed. But I have also seen plenty of resolve. People all across the country are donning their armor and doing battle to take our country back and put the Constitution and Declaration of Independence back in prominence. Never before has an “entitlement” package ever been repealed. I have heard that from the rightosphere. But never before have Conservatives demonstrated en masse. Until 2009. There is a reason the “Silent Majority” was very apt, but no more. We are no longer silently plodding along. We are loudly standing up and being counted. Looking throughout history, “never before” usually meets up with “until now.” Well, this is the “until now” that the left doesn’t want to believe can happen and some on the right don’t believe can happen. But it will happen, with stoicism and resolve. My blog wanderings brought me to The Camp of the Saints and a lot of linkage and excerpts from multiple conservative sites expressing the resolve to fight and win. I was also reminded of Patrick Henry’s famous words, so I looked them up and found more than I expected. It came from an entire speech, which it would behoove you to read. Because Patrick Henry has a lot more to say in that speech about today. Do not forget that the colonists were not all in favor of independence. In fact, 1/3 were in favor of continued subservience to King George, 1/3 were in favor of independence, and 1/3 decided they didn’t have a dog in the fight. Never give up. Never surrender. Never, never, never surrender. I am in the process of building a new page, ObamaCare Roll Call (this link and the button at the top of the page take you to the roll call vote I have on my site), creating a list of all who voted on ObamaCare, whether they voted Yes (for the abomination) or No (against the abomination). I have already added the extremely incomplete page because it needs public dissemination as quickly as possible and I’m more than a little bit slow on things. I will not add the Senate roll call because that single roll call is very simple. All Senate Republicans in office at the time voted “No” while all Senate Democrats and Independents voted “Yes.” But I intend on posting their election years. But I would like your help. It would take a serious amount of effort to tag the State to every member of the House of Representatives, and even more effort to tag the District. I would like your help in that regard. It is important to know where the darkness is, but it is more important to point to the light. Those who voted to tear down Freedom in this country need to be ousted so Freedom-loving people can rescind this nightmare of servitude to Government. It is not good enough to “throw the bums out” if the newly elected are “bums” as well. While I am pointing out the darkness, I very much want people to point out the light. And this is where you can help, as well. I would like viable candidates, web sites, donation sites, etc to replace the darkness with the light. While I fully admit I will vote third-party when neither major party candidate is acceptable, third-party is not a winning strategy. It is only a punishment strategy. We need strong “limited government” candidates from within the two major parties and we need to bend the two major parties back to “limited government” stances and away from the overarching omnipotent central government stance toward which those parties have been gravitating. UPDATE 0919 EDT (0819 EST): My Roll Call page is complete insofar as the House vote of Nov09 is concerned. It will take some time and effort to add the Mar10 vote. But the Nov09 “Yes” votes for intrusive government all need replaced. And I need information to help replace those intrusive-government folk with limited-government folk. Help me show forth the light on the darkness that is exposed. UPDATE 1834 EDT: I have finished adding the Mar10 House vote to my Roll Call page. By my count, 5 Democrats and 1 Republican voted “yes” the first time around and “no” the second time around, while 8 Democrats voted “no” the first time around and “yes” the second time around. 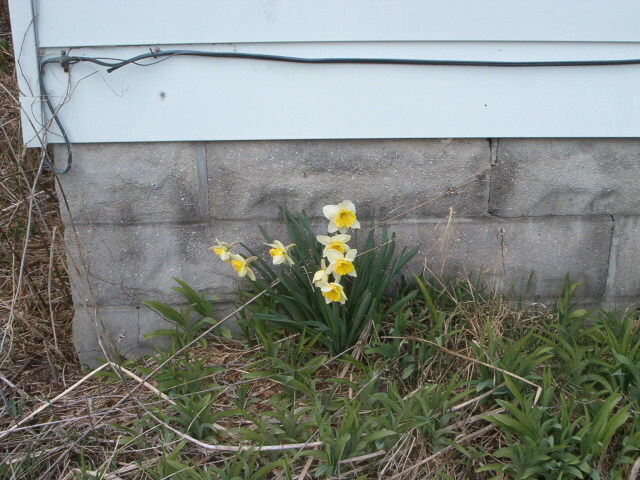 Six years ago, or so, I planted 28 daffodils. Since then, they have multiplied. 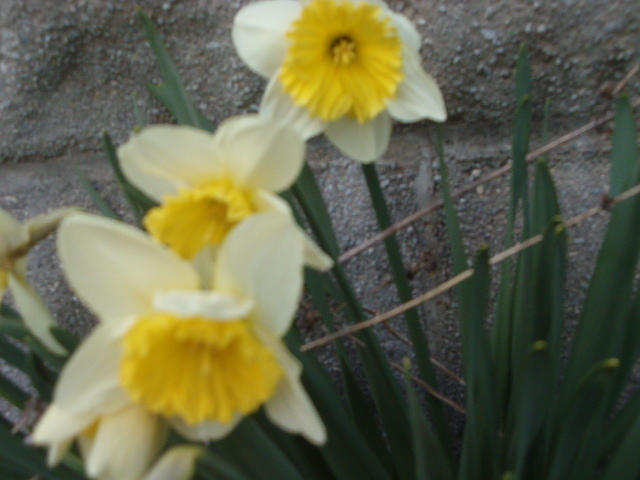 This year, my first daffodils to bloom are over 25 feet away from my Professor Einsteins and over 30 feet away from my other daffodils. They have bloomed in a lily patch. The lilies will bloom in a couple months.